Now that my kids are in elementary school, the adorable preschool-type seasonal crafts that used to come home are few and far between. It’s making me nostalgic for those days of tissue paper squares, glue, and googly eyes! 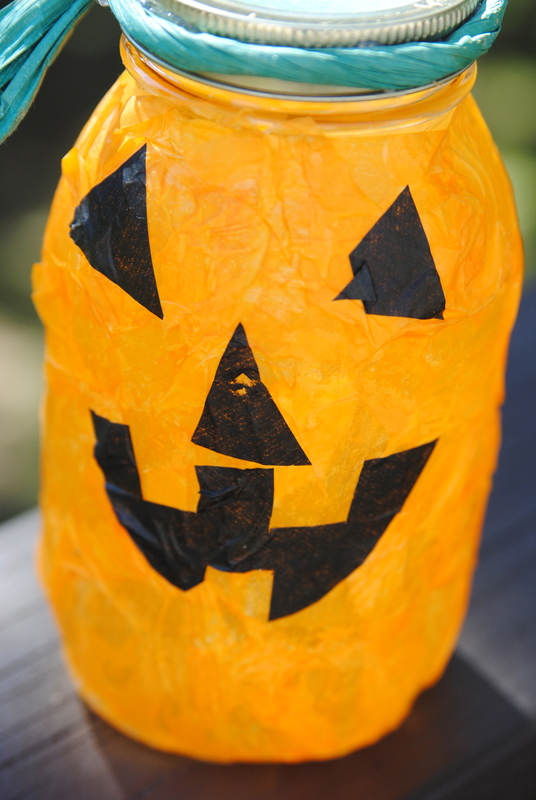 When I pulled out the fall and Halloween decorations this year, I was reminded of a few kids’ craft favorites from yesteryear– pumpkin lanterns, mummy jars, and more. 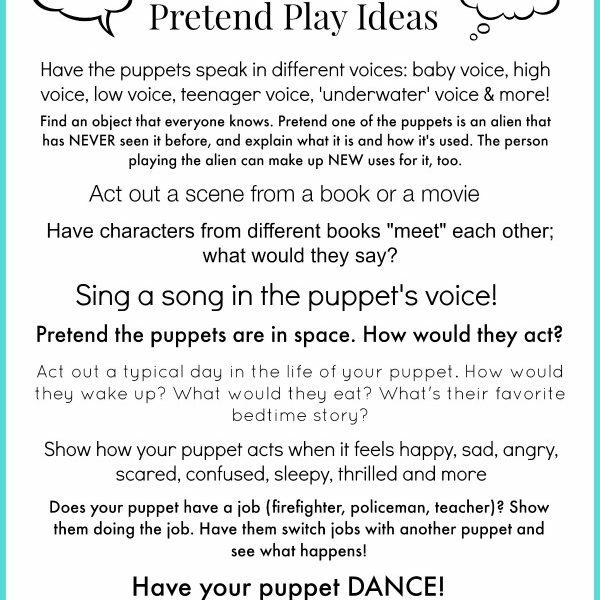 What’s especially ingenious is how these teachers made them using common household items like spaghetti sauce jars and plastic cups. 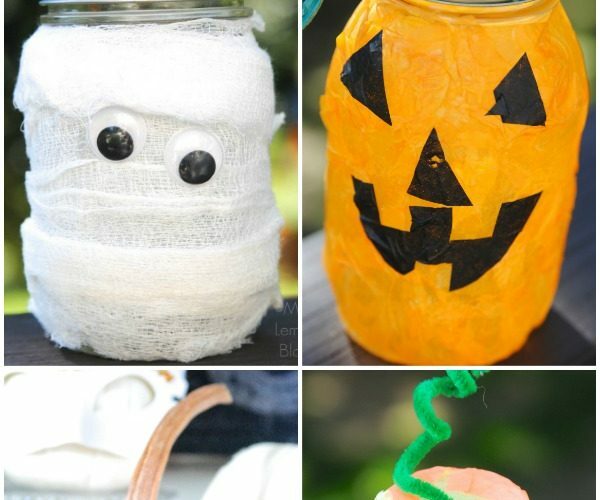 Here’s a few of our favorite quick Halloween craft ideas for kids, along with a no-carve pumpkin idea too, take a peek! Proving that even preschool teachers love Pinterest, this mason jar mummy came home last year and we’ve been in love since. Simply glue one end of gauze to a mason jar (or any jar, really) and wrap around the jar. Glue the other end to the back. 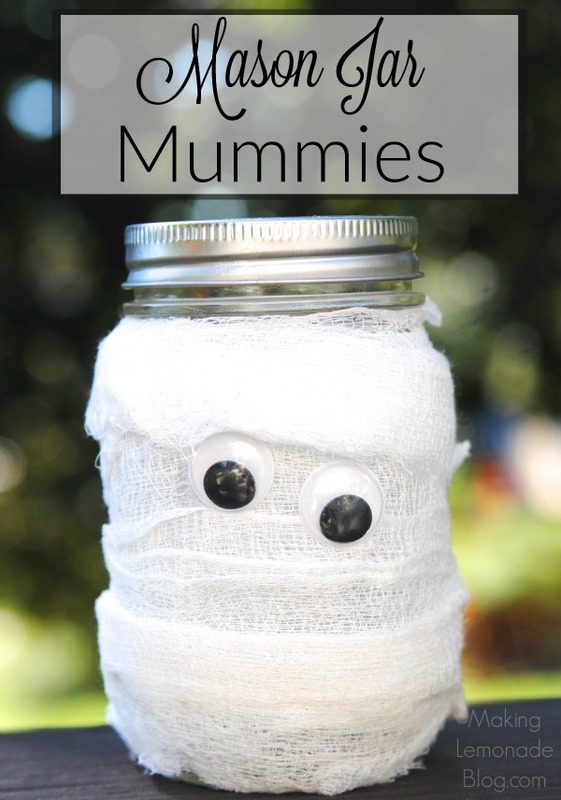 Add two googly eyes and a flameless, battery operated candle inside for a spooky, silly Mummy jar. Boy, this thing GLOWS! 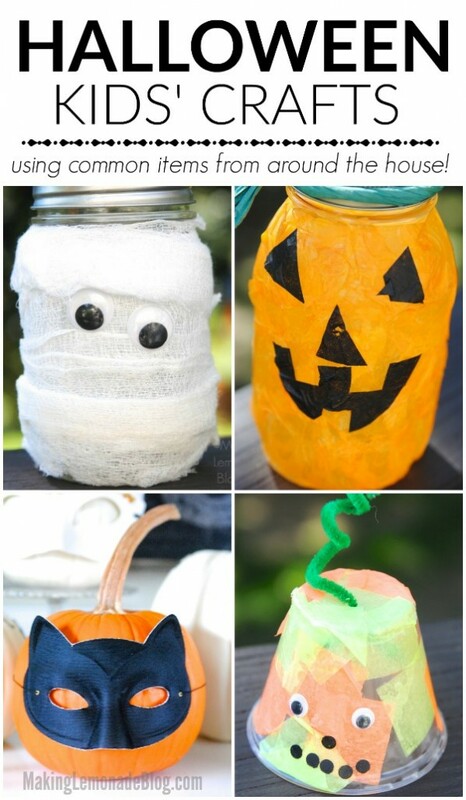 Created from an empty pasta sauce jar, you can make a few and have them line the walkways or steps on Halloween for a festive glow. Mix school glue and water until it’s thin. 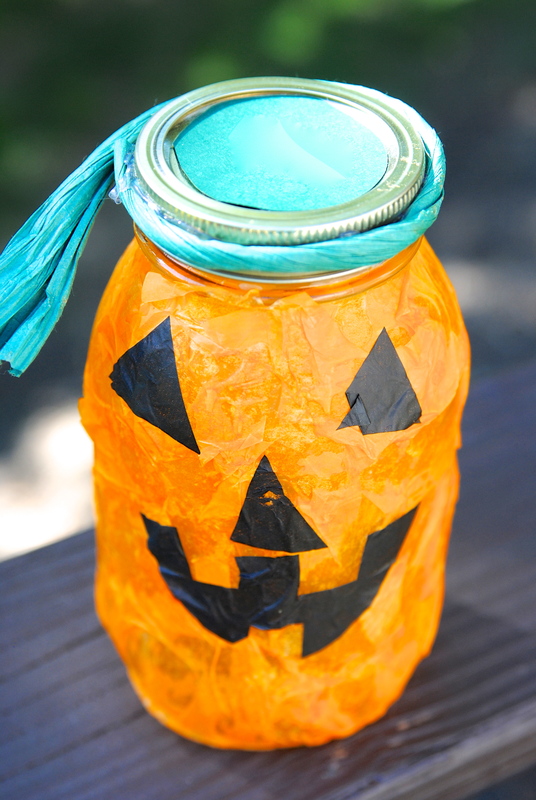 Then, paint the jar with the watery glue concoction and add orange tissue paper squares on top. Add on a face from black tissue paper. Once in place, you can brush on a last layer of the watery glue for a final glaze. After it dries, pop in a battery operated candle for an eerie (cheery!) glow. 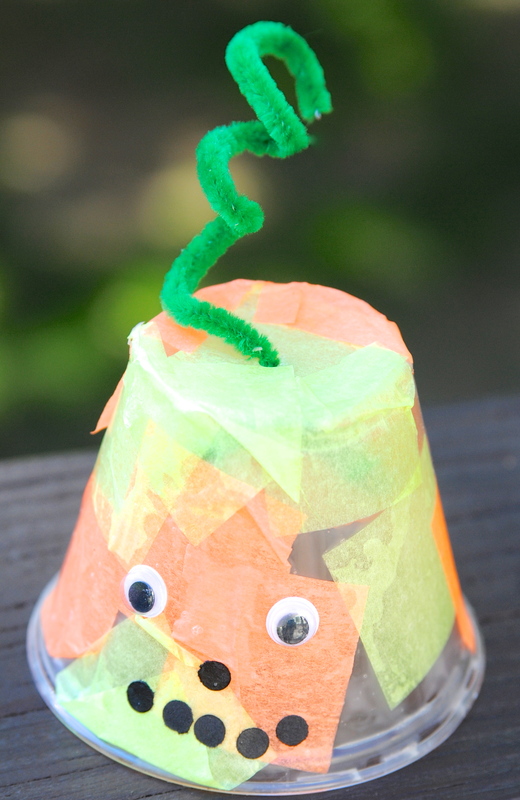 Follow the same steps above for the Pumpkin Lantern, but do it on an inverted plastic cup. Add googly eyes and punched out black dots for a mouth. Punch a hole in the top and insert a pipe cleaner ‘stem’. A super cute little pumpkin for those who wish to avoid using glass such as in the above two ideas! My kids came up with this one while strolling the aisles of the craft store! 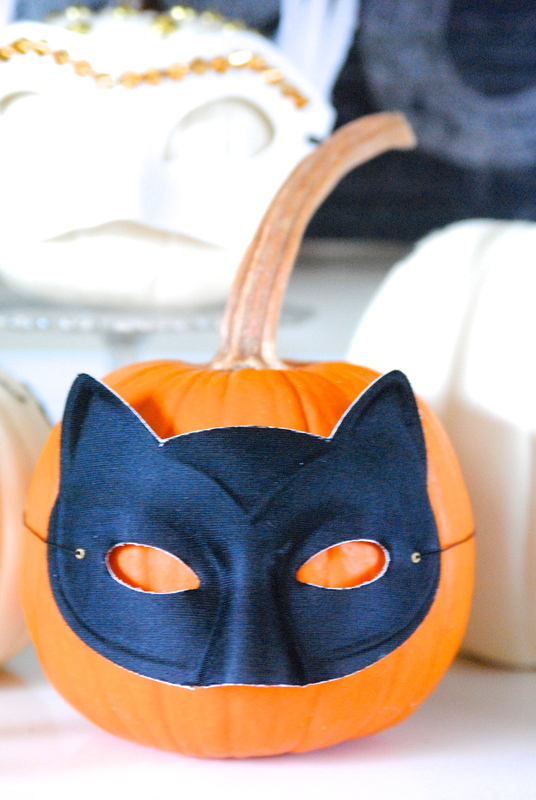 We used a store-bought cat mask, but you can also see the gold studded mask we decked out too. They sell foam masks for $1, next time we’re going to pick up a few and add pom poms, glitter, THE WORKS. 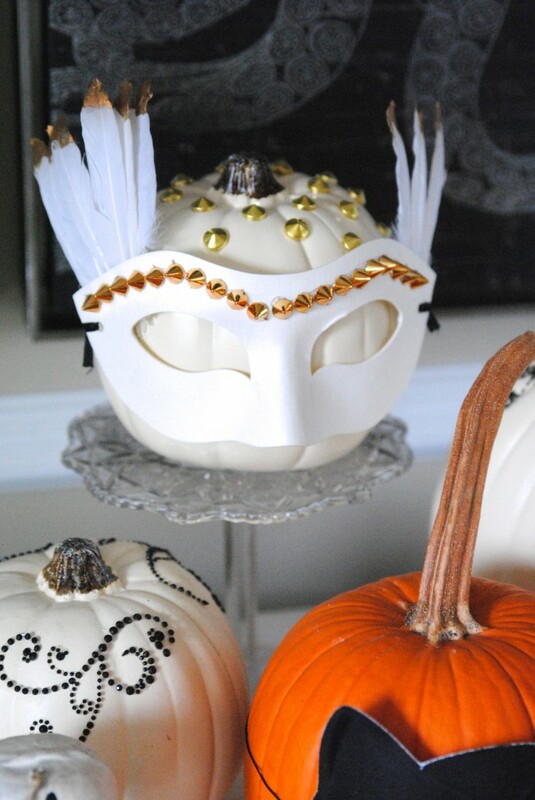 But these photos show you can use any old mask you have on hand for a no-carve pumpkin idea in seconds! So go raid the pantry, it’s kids’ craft time! What other quick crafts do you make using common household items?